Should You Currency Hedge Stock and Bond Funds? On balance, Dollar-based investors owning foreign assets hedged back to the Dollar is generally a good idea. In the case of bonds, we think currency hedging is virtually always a good idea. In the case of stocks, we think it is typically a good idea, unless you believe you have the time and skill to switch back and forth profitably between hedged and non-hedge stocks — and that you have the discipline and emotional strength and consistency to deal with the whipsaws that come with that approach. Alternatively, you may find actively managed funds that effectively adjust their portfolio back and forth between hedged and unhedged. For those in the accumulation stage with long-time horizons and doing Dollar-Cost-Averaging; the extra volatility of unhedged foreign equities could be an advantage. Volatility is helpful with regular periodic investing, and harmful with regular, periodic withdrawal. Therefore, retirees are better served by the volatility reduction that Dollar hedging is supposed to provide. Currency hedging equities is a two-edged sword. When the dollar is rising, hedged funds outperform unhedged funds. When the dollar is falling, hedged funds underperform unhedged funds. There have been prolonged periods where one approach or the other has been superior, but in the very long-term the currency effect may be a wash.
You can see from these charts that the monthly returns (thin gray lines) vary wildly. The cumulative return differences (blue and orange lines) can have periods of several years of differential performance of hedged versus local currency returns. Even though there are substantial periods of differential performance, the volatility is so significant, that whipsaws are a real impediment for many investors who wish to ride the currency trends by switching between hedging and not hedging. But that is over the long-term. Over shorter periods of a year or two or three, for example, the choice to hedge or not hedge is quite material. Hedging reduces one source of volatility (currency exchange rates at the portfolio level), but leaves unmodified the volatility of foreign stock expressed in the local currency; and the effect of currency exchange rates on the internal financial operations of the stocks in the portfolio. For global giants currency effect is hard to pin down. Major US companies may be massively exposed to foreign exchange; and foreign domiciled companies may do large portions of their operations in the US or in Dollars. Global multi-national companies may be doing a substantial amount of currency hedging internally. For a concentrated portfolio of global multi-national companies, the question of currency hedging at the portfolio level many be a more debatable one. The three major world currencies in terms of foreign exchange trading are the Dollar, the Euro and the Yen. 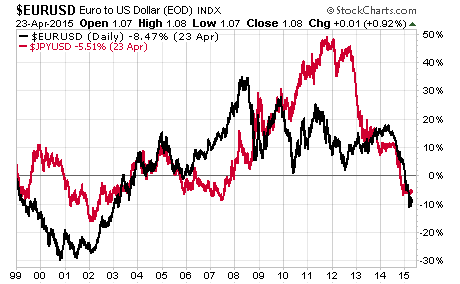 These charts show the performance of the Euro and the Yen versus the Dollar over 16 years and 3 months. From 2002 through 2004, with the Yen (red) rising versus the Dollar, if you chose to invest in Japan, you would have done better with an unhedged Japanese equities fund such as EWJ, instead of a hedged fund such as HEWJ available today. Then for 2005 through the middle of 2007, the Yen was falling and you would have done better with a hedged Japan stocks fund. From last 2012 through just recently as the Yen was falling, you would have done better with a hedged Japan fund such as recently available HEWJ. Similarly, from 2002 through 2004 with the Euro rising versus the Dollar, if you chose to invest in the Euro Zone countries, you would have done better owning an unhedged fund such as the Germany ETF (EWG). However, from the 2008 crash through today, the Euro has been on a volatile up and down ride versus the Dollar, and you needed to switch back and forth several times to be on the right side of the currency trends. Over the past year, a hedged Germany fund, such as HEWG would have been the superior performer. Of note for investors with long-term horizons, particularly those doing regular periodic dollar-cost average investing; there would have been little benefit of seeking hedges. As you can see over periods of 10 and 15 years, currency effect can amount to virtually nothing. And, those doing dollar cost average with an unhedged fund would have benefited by the volatility and peaks and troughs along the way. 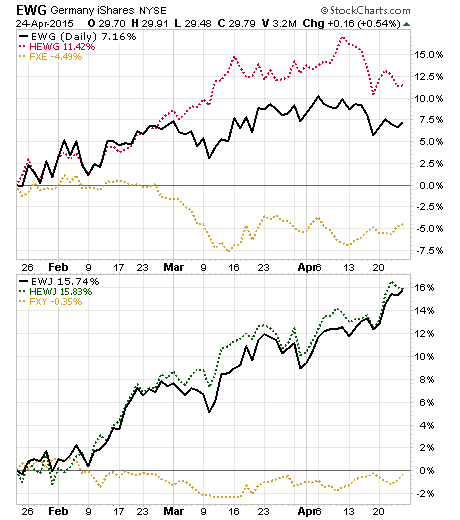 The top 1 year chart below shows the performance of the unhedged Germany ETF (EWG), the hedged Germany ETF (HEWG) and the Euro exchange rate versus the Dollar (FXE). The bottom 1 year chart below shows the unhedged Japan ETF (EWJ) and the hedged Japan ETF (HEWJ) and the Yen exchange rate versus the Dollar (FXY). They both show the substantial outperformance of the hedged approach during that time period. 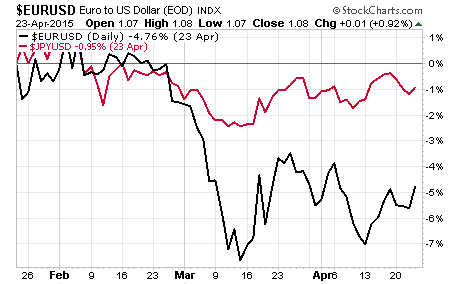 Over the last 3 months, however, both the Euro and the Yen seem to have stabilized against the Dollar. 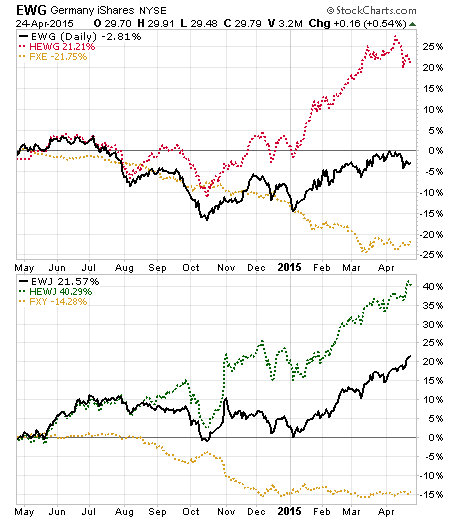 Over 3 months hedging showed no advantage, and in fact a slight disadvantage to owning the hedged equity funds. 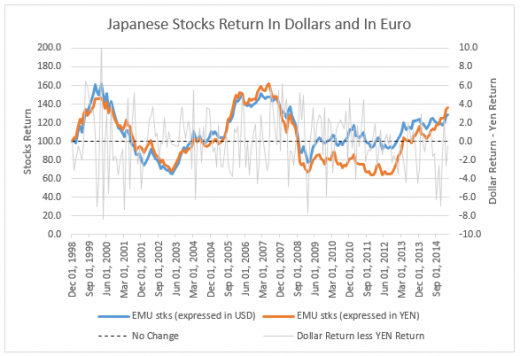 If the current generally flat exchange rate performance of the Euro and the Yen is to continue, or is harbinger of a weakening of the Dollar, then the unhedged forms of the Germany and Japan equities (EWG and EWJ) would be the superior choice for those moving between hedged and unhedged. With QE increasing abroad and the Fed moving away from QE, an argument can be made that further Dollar strength is ahead, and that hedged equity funds are a better choice for total return. The consensus is that the Dollar has more strengthening ahead. How far and how long the Dollar will rise is, of course, uncertain. If you are young and Dollar-Cost Averaging, consider using unhedged equity funds. If you are retired and withdrawing assets (without excess assets), consider using hedged equity funds. If you are good enough with calling trend reversals (as opposed to volatility noise) and can live with a certain percentage of decisions being wrong due to whipsaw markets, then moving between hedged and unhedged investments may be suitable for you. If you are a Dollar based investor and will not chastise yourself for sticking with Dollar investments when unhedged assets outperform, then stay with hedged funds. If you don’t have a view, and aren’t one of the above, it may make sense to split the baby – 50% of international stocks hedged and 50% unhedged. 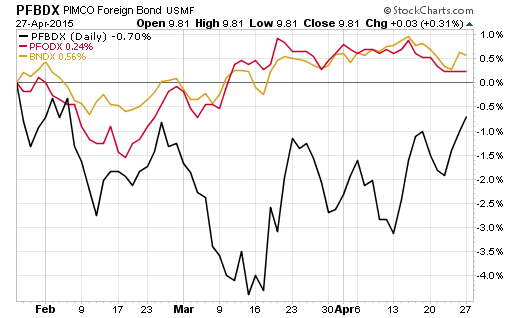 With foreign bonds hedging is a more clear-cut decision, unless you actually want to trade currency, but then you might be better off doing that directly in the FX or futures markets. U.S. investors are likely to want bonds in their portfolio to reduce overall volatility, and/or also to match certain Dollar denominated capital expense or periodic withdrawals intentions. Hedging helps realize those goals. Currency risk significantly increases bond portfolio volatility — that’s a bad thing for most investors who buy bond funds. 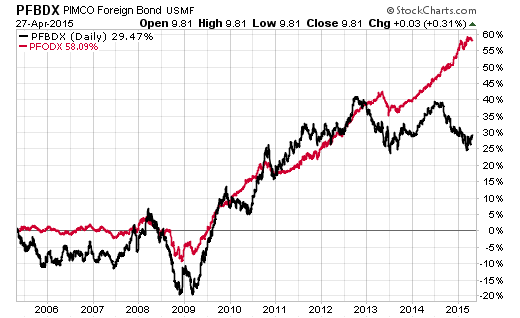 This 10-year chart of the PIMCO foreign bond fund hedged (red) and unhedged (black) shows the volatility dampening effect of hedging. “Foreign currency exposure by far dominates the volatility profile of international bonds. It accounts for about two-thirds of volatility. So currency hedging will minimize that currency volatility or currency risk. This short-term chart showing the Vanguard international bond fund (BNDX) in gold versus the PIMCO hedged international bond fund (PFODX) and the PIMCO unhedged international bond fund (PFBDX) illustrates the point that currency creates the vast majority of volatility in a bond fund at a more granular level. By including the Vanguard fund, it helps to show that the hedging effect is not something peculiar to PIMCO. “investors can isolate the interest rate and the credit risk and can maximize the diversification benefit that international bonds bring to their portfolio… [the portfolio] uses one-month forward currency exchange transactions, as the index is rebalanced the last business day of the month. For young investors in the accumulation stage of life, unhedged foreign equities may be preferable, but for investors in the withdrawal stage of life (without excess assets) hedged foreign equities are preferable. You have to be effective at trend and trend reversal analysis to move back and forth between hedged and unhedged equities with satisfactory results. This entry was posted on Monday, April 27th, 2015 at 11:09 PM and is filed under Investment Strategy. You can follow any responses to this entry through the RSS 2.0 feed. Both comments and pings are currently closed.